Crayons, especially wax crayons, can be applied to a bisqued pot as a wax resist. They can allow you greater freedom in attaining thinner, crisper lines and are especially valuable for linear decorations. For these lines to remain after firing, however, you do need to be aware of how runny your glaze will be. 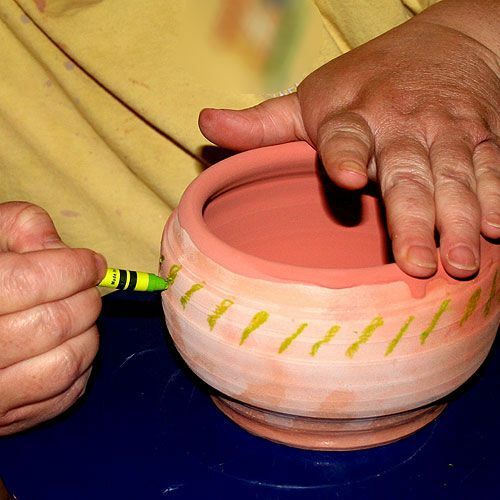 Warming the pot first will make the crayon draw much smoother lines on the pottery. You can easily accomplish that by blowing hot air on the bisqueware using a hairdryer. For this pot, I fist decided upon the decorative effect I would be looking for. I then glazed the interior, pouring glaze in and then back out. As you can see, I decided on a slanted-line design moving around the shoulder of the pot. I deliberately used a brightly colored crayon so I would be better able to see the resist once applied. This picture was taken after the exterior was glazed. Note that you can see how the glaze coat goes right over the waxed lines and is able to remain; this is especially visible on the right. This is due to the thin area of resist and it could very well be a major problem during firing. I had already decided that I would be wiping the entire shoulder clear of glaze. This would leave a very thin coat of glaze everywhere except for the stripes created by the wax resist. You can see on the left-hand side where the glaze has almost been completely cleared from the shoulder. Also take a look at how using the brightly colored crayon made it so much easier to see the waxed areas. The wax layer itself tends to be fairly thin with crayons, so that added color indication can be very helpful in knowing when a glaze was been completely wiped off the resist. All glaze must be cleaned off waxed areas. Otherwise, the glaze on top of the resist may adhere to the pot after the wax is burnt off, or the glaze may fall to the kiln shelf, melting there during firing. To clean crayon resists, I find it easiest to use a cotton swab. However, when larger areas are to be cleaned sponges, damp rags, or damp paper towels are good choices. After cleaning the crayon wax resist, I allowed the pot to dry completely. It was then fired in an electric kiln to cone six. Note the subtle stripes of completely bare clay body left by the waxed areas within the almost-clean area where glaze had been removed. There are some things to note about firing any combustible in an electric kiln. Burn-out always releases some gases that will harm kiln elements. This includes wax resist. To avoid damage to kiln elements, use thin layers of wax resist. If you have thick areas, warm the pot with a hairdryer then blot the waxed area with paper toweling. This will help remove excess wax. Do be careful, however. Work very gently, so you do not harm the raw glaze coat. Another option is to fire the piece(s) inside a sagger. The sagger will contain the gases and protect the kiln's elements. Of course, if you are firing in a fuel-fired kiln, none of this applies. The damage is only done to electric kiln elements, not to the fabric of the kiln itself. What Supplies Do You Need to Get Started as a Potter?